This is a compact evergreen shrub with gorgeous lavender-purple flowers 1” diameter produced over an extended period. 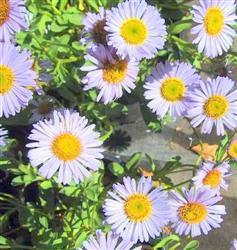 This useful, small daisy provides masses of flower color for mixed borders, rock gardens, coastal bluff gardens, containers or as a small scale groundcover. Dead head the spent flowers for best appearance and longer bloom. Provide some partial shade inland in the summer months. The butterflies will love you for providing this plant!